Free marine chart plotter and charts? I’m in! Have a laptop or tablet and want a marine chart plotter? With this free software, free global electronic charts and a $30 GPS antenna you are in business! This chart plotter shows the position of your boat superimposed on the marine chart and displayed on your laptop or tablet. This software also displays tides, currents, navigation aids and anchoring information! Whether a backup system or your primary chart plotter, you will find this valuable asset will improve safety and confidence on the water. During this Quartermaster Yacht Club Tech Talk we will show you the capabilities of the software, provide tricks and tips to use the system and show you how to download the software and charts onto your computer. 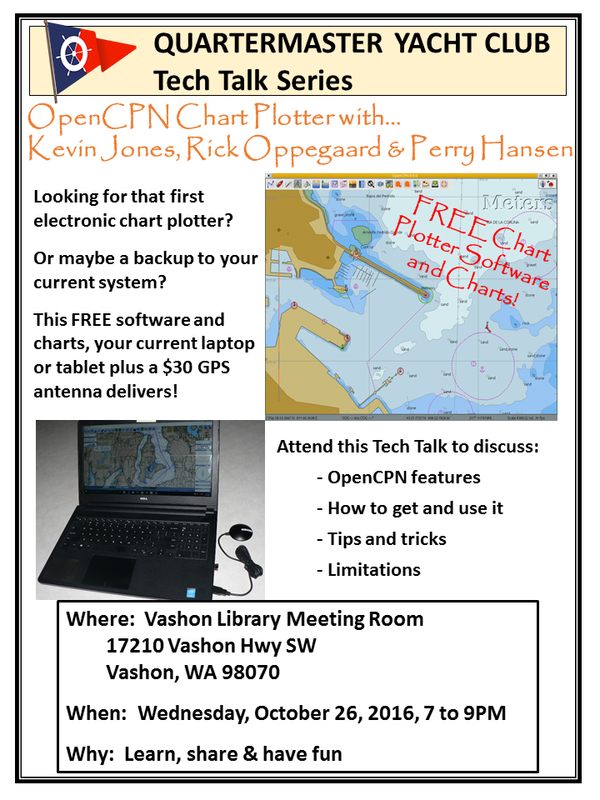 Bring your laptop or tablet to the Vashon Library at 7PM on Wednesday, October 26 and walk out the door with a fully functional chart plotter!